As you may or may not know, Illamasqua is slowly becoming one of my favourite make up brands! I love absolutely everything about them & as a company i think they are amazing! 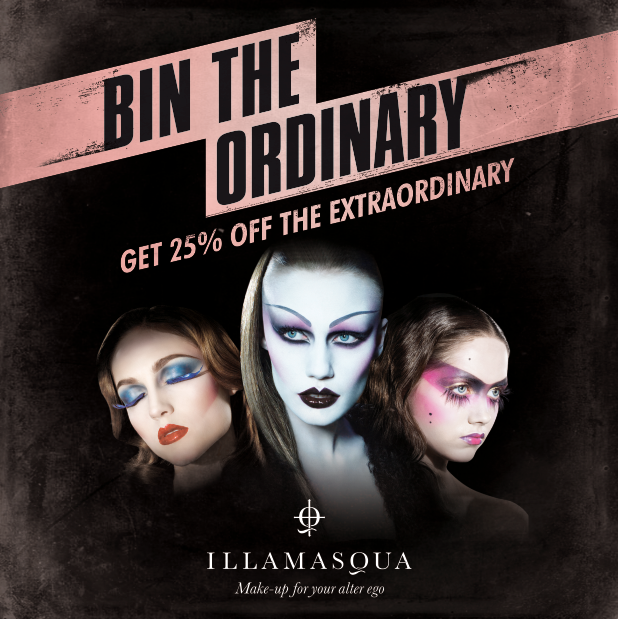 So i was very excited to hear about their upcoming project, for 2 weeks only you can exchange your used, unwanted make up at Illamasqua counters in exchange for 25% off any of their products! I do think i need to hit the Trafford Centre & definitely take them up on this amazing offer! Sounds fabulous right? So girls tell me, whats on your Illamasqua wishlist? Aww I am so jealous of all you UK girls who have this opportunity. I only have access to Illamasaqua through Sephora over here. This program sounds amazing...I already want to pick up a few Illamasqua lipsticks and blushes, but 25% off would definitely be an incentive for me to buy even more. Maybe it's a good thing I can't do that over here then, haha :) What are you planning on getting? Wow, thats an amazing deal! I wish we had an Illamasqua boutiqe here in the states! I loveee Illamasqua, I can compare it to the likes of MAC. I love thier lippies especially; particularly Obey. My wish list is the cream blush in Promise!! Hi, for some reason I cant find you blog sale of - hang loose, is it for sale still?? ?